If you are like me, you sometimes wonder if the web browser of choice (especially when it is crashing on you!) is the still the best choice. PC Magazine comes to the rescue with their latest article: The Best Web Browsers of 2017. I’ve heard of Microsoft’s new Edge, but how many of you have heard of Vivaldi, and Brave, and Neon? They were all new to me! Thinking about reevaluating my web browser had me asking the question, what about my web-based email service? I have a suspicion that Yahoo may be responsible for my browser crashes lately, but my long-term history of saved message has made me less eager to change services. The people at TechAdvisor offer us up-to-date insight with The Best Free Email Services for 2017. The people at LIfeWire also chimed in with their 2017 Best Of post. New to me were Yandex and ProtonMail. Steven Riccio, a professor of International Business & Management at Dickinson College recently posted Habits of Highly Effective Higher-Ed Professionals, Part 2: Finding Your Purpose. If you missed his Part 1 article back in June, it is also worth visiting. In Part 2, Riccio thoughtfully extends the thesis of his previous article which focused on “sharpening our saws” for more effective work, and takes on the challenge of shifting our professional focus from “pursuing happiness to pursuing purpose.” He looks at how many strive to reach happiness via the completion of goals and challenges, that we end up exhausted, and still missing the ultimate goal of happiness. Riccio challenges us to look inward and discover what our true purpose is for our lives. Did you follow the directives he gave mid article and write down what you believed, at that moment that your purpose was? Did it develop and change by the time you finished the article? ScienceFair is a new open source desktop science library hosted on Github. It “was developed by Code for Science and FathomLabs along with other contributors, with support from Mozilla Science Lab, eLife and the Dat project.” (per site). You can read about all the details of the new launch at the eLife Labs blog. While they are planning a reference manager feature for upcoming releases, ScienceFair is not another reference manager. Instead the developers have focused their efforts on providing a better application for searching open access science literature and providing a quality reader for the articles. They also have begun to offer some data and text mining features which they intend to be a focus for future enhancements. While still in their very early days, ScienceFair is an application worth keeping our eyes on. And Finally, from our friends at the mindmapping software blog, we have their newest mindmapping comparison for 2017. More comprehensive than ever, this is a great resource for anyone interested in mindmapping software options. Lazy days of Summer.. or Hobbyist’s Mecca? Until a few years ago, I never thought about the number of different hobbies and interests that I had. Then my sister retired, and I watched her struggle for several years to deal with the loss of her vocation, which had been her life. She didn’t have hobbies – she put everything into her job; then, when her job was no longer there, she didn’t know what to do. Over time, she replaced her hours working with other pastimes, and now, almost 5 years after retirement, she recently told me that she was very happy being retired. I on the other hand, find myself increasingly frustrated that my avocations far out-stretch my time and energy available. How about you? Which camp do you fall into? Too many, or not enough interests and hobbies? Business Insider, summarized The 20 most common hobbies of the richest people in the world last year. If you guessed that number 1 was golf, you were way off! In fact, the most common past-time for the world’s richest people is Philanthropy. That’s a warm fuzzy for you! (Golf was actually way down at number 14!) Happily for us librarians, reading made the top 20, and was really the only one that I had in common with the world’s richest people. Though I may desire to spend my days in philanthropic pursuits and worldwide travel my purse is a little too light for that to be a major past-time for me at this time. If the Business Insider list was a little outside your comfort zone, you can also check out Lifehacks article: This List of 50 Low-cost Hobbies Will Excite You. I am being very careful to not read this article very closely, because it seems I have the opposite problem… too many hobbies for the time and energy I have. Hence the topic of hobbies on a productivity blog. How do I balance my life so that the things that give me most joy don’t get stored on the back burner? What if your work is fulfilling, but leaves little time for more creative pursuits? The Muse discusses this at their blog: How to Find and Make Time for Your Passion Even When You’re Busy. Lifehacker offers a Geek’s Guide to Budgeting Hobbies, because we all have experienced the financial hit as well as the time crunch when it comes to some of our favorite past-times. I particularly liked their “mini-vacation” hobby holidays idea. I have actually been able to somewhat successfully implement that in my own life by wrapping two vacation days around holiday long weekends, giving myself five days to focus on a certain cleaning project (Memorial Day was my Garage! ), or hobby (I have 4th of July earmarked for putting together a quilt for ALABiblioquilters). The Time Management Ninja reminds us Why You Need a Hobby to Be More Productive. His advice is well taken. It is hard to remember sometimes, when all our ToDo lists are screaming at us, but having experienced burnout more than once during my working years, I can fully endorse his advice. In retrospect, I would much rather use the energy and time expended trying to recover from burnout on hobbies and creative outlets of my choice. How about you? Now, during the “only slightly” less crazed days of summer, join me in searching for precious pockets of time, energy and money to devote to rekindling our passions in our favorite (or new!) hobbies. Mendeley recently published a nice tips paper on scientific writing called Clarity and Impact: Key Tips for Writing a good Scientific Paper. They also reference in the article, an infographic on the topic. Unfortunately, the link in the Mendeley article isn’t working. I did some digging and found the correct link: Infographic: How to write better science papers. I have always considered the Wayback Machine to be something of a miracle. I am so happy that others have recognized the important contribution archive.org is making as well. Have you tried the Chrome Library Extension for Amazon? This is one extension that I think it totally cool! You add the extension to your Chrome browser and identify your public library. Everytime you search Amazon for a book, the extension will show up on the right side of your screen and notify you if your public library has the item. There will be a direct link so you can log in and request the book right away. Profhacker recently had a post on this feature, showing you how it works for Multiple (!) libraries. Michael Larkin, Professor of Writing at Berkeley and author of the blog Culture Mulching, posted an excellent article entitled “To Read Well on Screens, Change Your Mindset.” Make sure you read all the way to the bottom of the article. He and his Berkeley colleague have put together several helpful handouts for helping students get the most out of online reading. Mindful Magazine offers us this story on 5 Ways to Organize Your Phone to Unhijack Your Mind. And from Updato, we have this article on How to Organize Your Phone and Turn it into a Distraction-free Productivity Tool. And how about all those photos? Gizmodo addresses that organization challenge in The 4 Best Apps to Organize Your Phone’s Photos. Frankly, I just connected my Dropbox to my phone photos.. .every photo immediately gets sent to Dropbox, so my phone organization of photos isn’t a problem, but I do have to organize and clean out my Dropbox, lol. Kudos to two of my co-workers, Xueying Chen and Li Chen, for their publication of “How to Manage Library Projects with Trello” in the May issue of Computers in Libraries. They demonstrate how they used Trello to manage a research project involving international student usage of library resources. I love the colorful way that Infotoday presents their article with attention-grabbing illustrations. Chade-Meng Tan, was originally an engineer at Google. While working there, he was nicknamed by his co-workers as “Jolly Good Fellow”. It is now part of his business card, and he is a NY Times Best Selling author of his mindfulness book Search Inside Yourself and his followup book Joy on Demand. 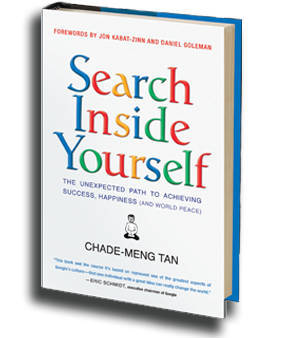 Search Inside Yourself was a mindfulness based training program that Tan developed while working at Google. The success of his subsequent book and Ted talk led him to establish his Search Inside Yourself Leadership Institute ( whose acronym is pronounced “silly”) Tan’s dream and life’s work is to spread mindfulness compassion throughout corporate businesses by showing how compassion will be good for their bottom line. Once accomplished, he believes this will spread compassion throughout the world and lead to his ultimate goal of world peace. He explains his Search Inside Yourself theory in this talk which he delivered at Dreamforce. 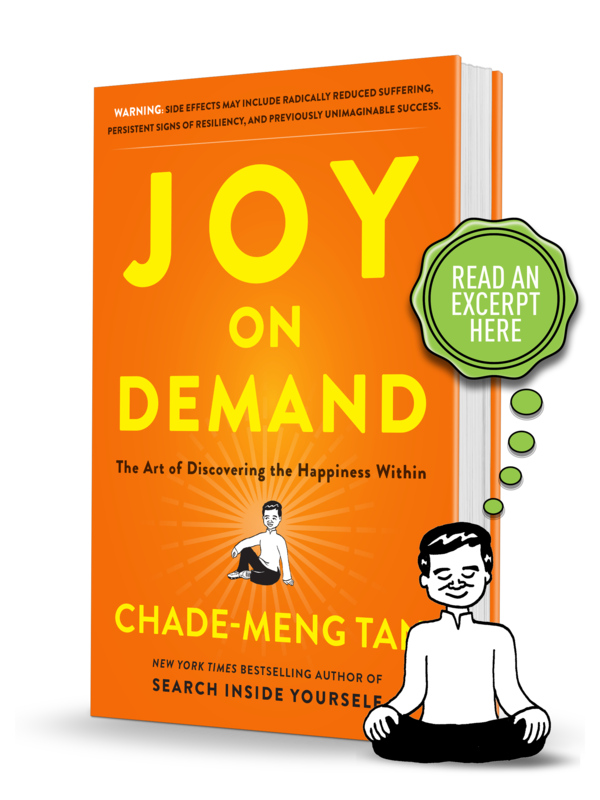 In 2016, Tan returned with his sequel book, Joy on Demand: The Art of Discovering the Happiness Within. Scientists have documented the positive neurological changes in a person’s brain after beginning a practice of mindfulness meditation. And Tan is likewise convinced of the power of mindful meditation in changing the set-point of a person’s response system from a negative state to a more positive, happier one. In his new book, he sets out to do that, providing us with the “skills to access joy” He begins with exercises to help the reader cultivate inner peace. He then gently and humorously turns our attention to the recognition of inner joy. Inner joy leads naturally into a cycle of goodness that includes compassion and kindness. He also addresses the co-existence of inner joy and pain. Even if you only sample a few of the ideas offered in this engaging read, you will find yourself feeling lighter inside and perhaps even fighting a smile. Links Roundup #34: Tidbits from around the web. Have the recent changes to Evernote’s pricing structure left you less than enamored with it as your go-to organization tool? Michael Hyatt, who has written often on his use of Evernote, recently took a second look at several of Evernote’s top competitors and created a great comparison review in his article: Three Evernote Alternatives and How They Stack Up. Also, our favorite folks at Evernote were busy taking notes for us at the 2017 SXSW Conference. Check their notebook here for highlights from the 30+ sessions in the Workplace Track discussing topics on workplace productivity and diversity. My favorite note was from Carmen Medina’s talk, “Update Your Critical Thinking Skills”, where she says “Whatever information comes to us, we believe that it’s an accurate representation of reality when in fact it’s just the information we’ve received.” Doesn’t that elegantly describe every Googling University Student you’ve ever met? Next we turn to Podcasts. For those of you who love to listen to podcasts while exercising or commuting, Bonnie Stachowiak offers her Podcast Greats for 2017. While Bonnie’s list focuses on Teaching and Higher Ed, Kylie, a brand new librarian, listed her favorite librarian podcasts recently on her blog. If you are trying to find podcasts for your library users, Nicole Hennig has discusses ways to find Diverse and Accessible Podcasts in her recent Dispatches article in American Libraries. The gurus at The Next Web reviewed the Best Chrome Extensions to Boost Your Productivity in 2017. And while LifeHacker and Tom’s Guide both reviewed the best Firefox add-ons last year, Mozilla is reminding us that they will be transferring from add-on features to WebExtensions by the end of this year. Do you use the Public Folder option in your Dropbox in order to share files with others? If so, this alert is for you! Dropbox has announced that they will discontinuing their public folder options. Individuals can share individual files by using a shared link. The public links were to quit working on March 15th. See all the details here.